You know that old pizza shop around the corner of your house or apartment? If you don’t have one, just pretend you do, and follow my lead on this introduction. Remember back in the day when it served only 2 or 3 different kinds of pizza, then over time, they got smart and creative, leading into cool stuff such as an expanded menu of toppings like ricotta cheese, steak strips, and BBQ pork. Sure, not everybody likes all of those toppings, but the point is, someone out there does, and the fact that it’s all under one roof with the possibility of it being served at once, all at the same time, when nobody else is doing it, is the part that’s pretty awesome. With that said, in a way, that’s exactly the kind of progression August Burns Red went through from day one up until now with their sixth album, Rescue & Restore. Surely it took some time for this Pennsylvania metalcore group to craft their sound to where it’s at now. Constellations saw some experimentation with time signatures, layering tracks, and even extended clean guitar parts. Around this same time, the band began putting out their Christmas singles, that began ranging in from what would be expected from a metalcore band (“Carol Of The Bells”), to slight changes of pace (“O Come, O Come Emmanuel”), to the sludge-filled post-metal track that was “Little Drummer Boy.” Then came Leveler, which blew people away with some of the band’s heaviest tracks to date, use of gang vocals, increased melody and even completely unexpected exotic riffs. Late 2012 saw the band putting out their Christmas album that was musically all over the place, and now that leaves us to their 2013 full length, Rescue & Restore. 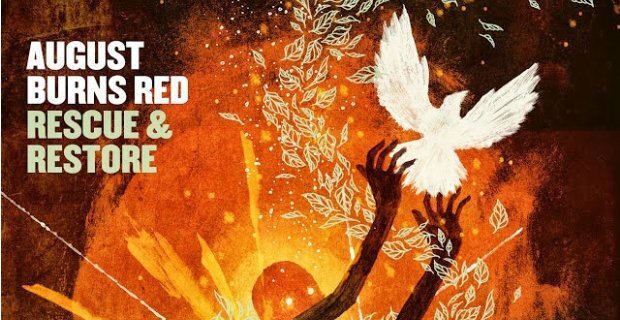 Holding back all desires to use flowery build-ups, I’m just going to say it: This here is pans out to be August Burns Red’s most creative risk – and reward – to date. Expectations are roundhouse kicked wide-open, rather than gently knocked on with the unrelenting opening track, “Provision.” Just as how the genre is, dark lyrics have always found their way into this band’s music, and this entire album is no exception, with a whole other level of anger, despair, and hopefulness. Frontman Jake Luhrs makes that very evident with the lines, These are the words of a man who finally let go and I am the victim, the culprit, the casualty, and the cause. Losing it all led me to you. From then on, things just keep pushing forth more and more. Acoustic guitars paired with strings are among the long list of things I wouldn’t ever imagine this group using in their bridges, but thanks to “Treatment,” I can now scratch it off. Even one step further, “Spirit Breaker” features spoken word, and goes into a bit of a lyrical foreign ground for the genre: life away from home while on tour. Things do scale back for a short time before they’re instantly swooped up again by what could be considered as the most unique track on the album, “Creative Captivity.” Here listeners will find some of the lowest and most obscure vocals from Jake Luhrs, finger-tapped cleans, strings, trumpets, and marimbas, truly showing just how the band is at the very top of their artistic game. I could go on and on all day over what makes so many of these tracks stick out from each other, but that would take way too long. Instead, how about I write about what makes this album stand out from the band’s past 5 LPs? There’s just a whole new level of in-your-face sincerity. The entire band has grown immensely as musicians, just listen to the chaotic fretwork on “Count It All As Lost,” or the drum-off between drummer ABR’s Matt Greiner and Adam Gray of Texas In July on “Echoes.” What we have here is a band who’ve dug themselves out of the rut that’s become today’s overall monotonous modern metalcore scene for the sake of showing that originality is still possible while at the same time, putting out their best release yet.